I received the DYMO labeler and compensation in exchange for this sponsored post. All opinions are my own. As you’ve probably guessed by now, I’m a huge fan of labeling. 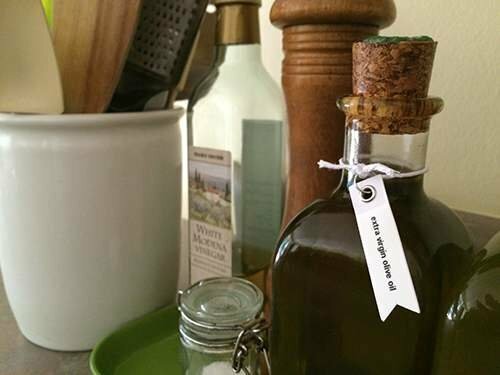 Finishing your organizing projects with labels helps ensure the order lasts longer because everyone who uses the spaces understands where things are, and more importantly, where they go when it’s time to put items away. If that weren’t enough, labels quite simply make a space look and feel more organized. 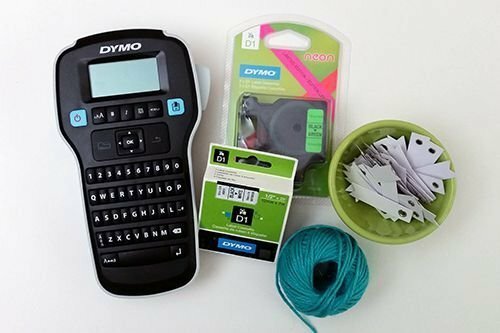 So when DYMO asked me to do a couple of sponsored blogs posts for them, where I got to try out two of their newest labelers, my decision was a no-brainer: Yes, thank you very much! goes way back in time, all the way back to my childhood. While in general, my Mom is the one I should credit for my organizing genes, my Dad was the one who introduced me to labeling. He had one of the original DYMO labelers, the embossing kind. He used it to label things like the various spigots in our garage, so he knew which one turned on which sprinkler system in the yard. His love of labeling was long standing and he loved labeling things with his initials ALP. His green labeler is one of the things I took from his home after he passed away. It still has ALP programmed in and ready to print. If you aren’t currently a fan of labeling, here are some great ways to get and stay organized with our new best friend the DYMO LabelManager 160. These projects are in areas that benefit tremendously from labeling because without labels in these areas, clutter creeps back in quickly. So these are terrific first-labeling projects. 2. The refrigerator. 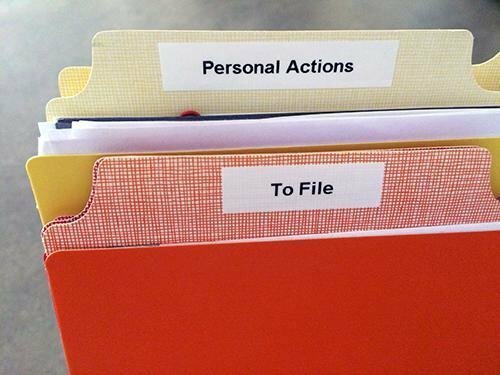 If you aren’t currently a fan of labeling, this one could seem over the top. But once you get past that, you’ll see that of all the spaces to label, the refrigerator makes the most sense. Here’s the problem. The refrigerator is one of the few spaces in our home that goes from super full to super empty in the course of a week. When the refrigerator is empty, the organizational structure is gone. Does milk go on the door or on the top shelf? If you’ve never established a spot for the milk (or other key items in your fridge) it probably goes wherever there’s an open spot. The problem with this approach is that you spend a lot of time sifting through your fridge looking for items, or worse yet, you forget you have them, until weeks later when you’re reminded of them due to an unpleasant odor. Labels solve all of this! 1. Purchase a labeler, some tape and batteries. The DYMO LabelManager 160 is a terrific choice for a few reasons. First, it is portable. 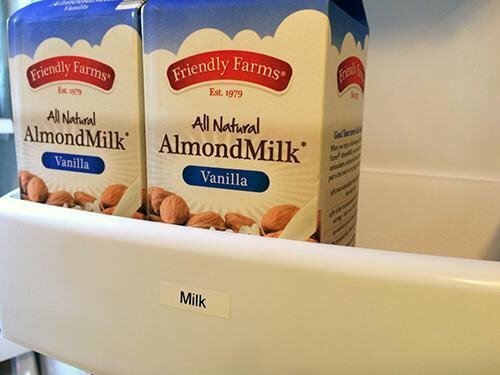 You don’t need a power cord or computer to use it, so you can easily create your labels right in the space you’re labeling. Second, there are several different styles of label tape available, including a limited time Neon collection. This is a great idea if you and your family members aren’t used to looking for labels since the bright color will catch your eye. And finally, you can select a variety of font sizes which means you’ll be able to label a wide variety of items and containers, from a super small tag to a large storage bin, and still create readable labels. 2. Select a starting project. Is there a space in your home that you feel you organize and re-organize repeatedly because the results just don’t stick? This would be a good place to start. Or consider starting with a shared space, places like the refrigerator, pantry or kitchen cabinets, where multiple family members take things out and put things away. Labels will help ensure everything gets put back in the right spot. 3. Have fun with it! Consider if labeling directly onto the container or storage solution gives you the look you’re after. Or if you’d like to try using tags and twine in conjunction with your labelers. 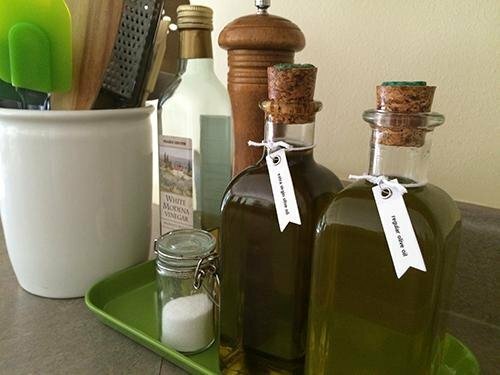 This approach works great on glass bottles and jars, as well as canvas bins and wicker baskets. , a try! You can find this model at Amazon.com, Staples, Office Depot, Walmart and Target for around $29.99. If you have any questions about the DYMO LabelManager 160, let me know in the comments! I’d also love to hear your favorite space to label. For example, do you have labels in your refrigerator, too, or do you think I’m nuts? Do tell. Thank you for sharing this spectacular post, it really does highlight some of the many different creative ways that the product can be used. I am also very happy to hear that you are enjoying the product and I hope it will continue being a useful tool for your everyday life. lol: “A blank file folder is a black hole.” What would you call a folder with the wrong label? Not nuts, but I don’t think my own hubby will be quite so keen for me to label up our own fridge. I however love the tags around the bottlenecks which I will use this clever hack for my bottles of homemade iced tea and coldbrew coffee – the dark liquids look almost identical in their glass containers unless I label them and condensation is a labeller’s enemy! Another little labeller hack I love is to print or what each cable is for in our house so that we can easily see what cord is needed or plugged in somewhere. Makes my life much easier. I recently purchased this label maker and sound the labels unwilling to stick to the things needing to be labeled. My question is simply this: is there a label that can fit this machine that has better adhesive than the labels the machine came with?